The first ‘Fantastic Beasts’ movie was an enjoyable return to the magical world of Harry Potter, loosely adapting a short novel J.K. Rowling had written for charity in 2001, and taking the audience to a different time period and setting within the wizarding world she had created. Whether the novelty factor has worn off or whether it’s something else, it is concerning that the second film in this prequel series is already showing signs of running out of steam – not a good sign with a further three movies planned after this one. 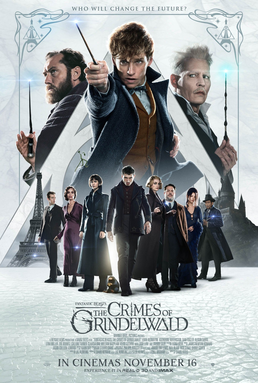 I was hoping for better but ‘The Crimes of Grindelwald’ is a movie that feels like 2 hours of set up for events of future movies, with the low stakes adventures that surround the main plot lacking the charm of the first film. Picking up after the events of ‘Fantastic Beasts and Where to Find Them’, this entry centres on the escape of the dark wizard Grindelwald (which appears far too straightforward) and his quest to gather followers, and the attempts of Newt and friends to stop him. If this sounds familiar it wouldn’t be a surprise, as Grindelwald is essentially a proto-Voldemort and the plot of this film goes to great lengths to tie characters into the events of the ‘Harry Potter’ series, with a ‘Star Wars’ esque approach to make everyone important related in one way or another. The main promise for the future of this series comes from two characters who are introduced here, in Jude Law’s take on a young Albus Dumbledore, and Johnny Depp’s turn as Grindelwald after a brief cameo in the previous film. Law is very good as Dumbledore and there are sparks of the old magic as we return to Hogwarts, whilst Depp delivers a menacing, yet quietly charismatic portrayal of the dark wizard, and the likelihood of these two going face to face in a future film is enough to whet the appetite. The other characters fare less well, and amidst a clutter of new faces, the likes of Callum Turner and Zoe Kravitz in particular feel short changed. ‘Fantastic Beasts: The Crimes of Grindelwald’ is a disappointing second entry in the series with an overstuffed plot that is more interested in setting up future films than in making this film entertaining in its own right. The performances are still enjoyable and the world J.K. Rowling has created is still one I’d happily get lost in, but I’ll be hoping for better when the third film comes around.